Since 1991 we have enjoyed designing and fabricating custom window treatments, bedding, pillows and accessories to meet our client’s individual styles. Whether you require window treatments, blinds or a design concept for the whole house our sophisticated yet affordable ideas will help transform your house into the beautiful, comfortable home you have always dreamed of. With so many choices available today selecting custom window treatments and furnishings for your home can seem like an overwhelming process. Our backgrounds in interior design and psychology make us uniquely qualified to assist you. 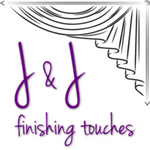 At J & J Finishing Touches we strongly believe your home is your sanctuary and should reflect your own unique and individual style. We personally communicate with you and oversee every step of the process to ensure you get exactly what you want at a very affordable price. We have extensive experience with numerous design styles and challenging design problems as well. You can feel confident that if a solution is possible we will find it! We can help with all your decorating needs including custom window treatments, blinds, bedding, pillows, cushions, upholstery, carpeting, furnishings, paint color selection and accessories. We come to your home with samples so you see the fabrics and finishes you choose in the setting they will be used in.